Gail and Missy in Liberia by the pool. While at the "lookout" a few days ago we spotted these four waterbucks on the Crocodile River, one male, and three females. Such beautiful creatures! It's not unusual for those of us who revere wildlife and conservation to have dreams of somehow "making a difference." With the best of intentions, in small ways, we may encounter opportunities to do so should we be in the right place at the right time and circumstances prevail. Few are fortunate enough to have the passion and dedication to make such a dream become a reality. It requires a degree of willingness to "step outside the box" of our everyday lives, faced against the tremendous odds of bureaucratic interference, prejudice and apathy to make something magical happen. 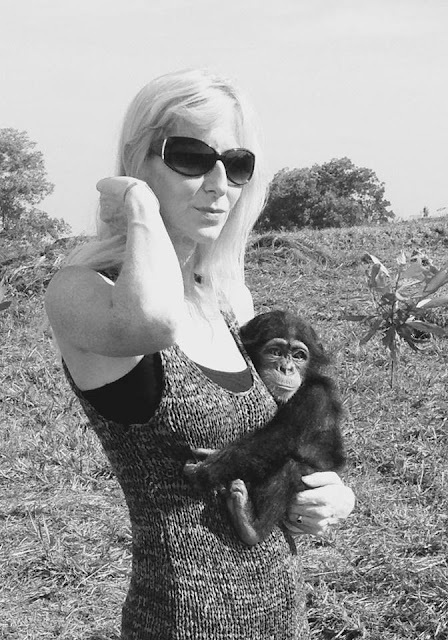 Gail Gillespie-Fox is just that person...in her boundless and fearless compassion and determination to have rescued bound-for-a-sorrowful-life-or-death chimpanzee in Liberia in 2013. 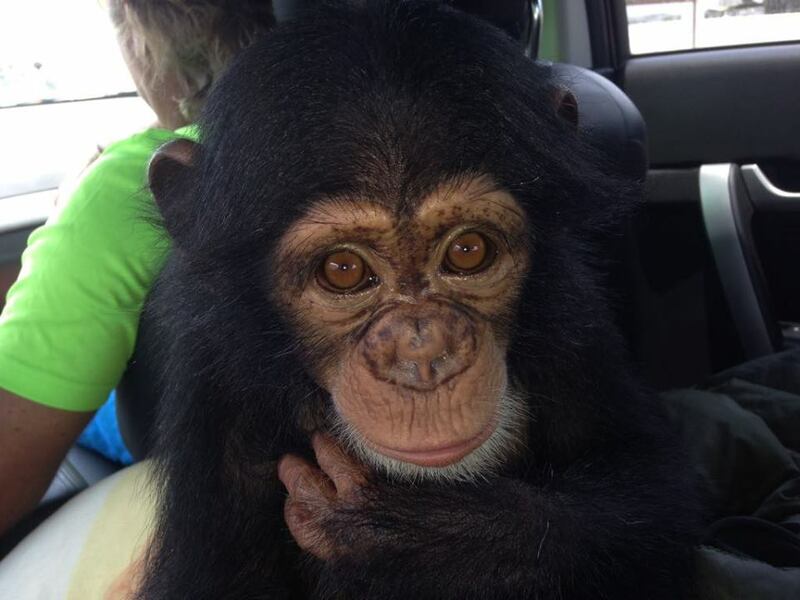 No, we don't mean rescuing in the sense of taking in orphaned Missy as a "pet" as many supposed rescuers wrongfully assume is what one must do. 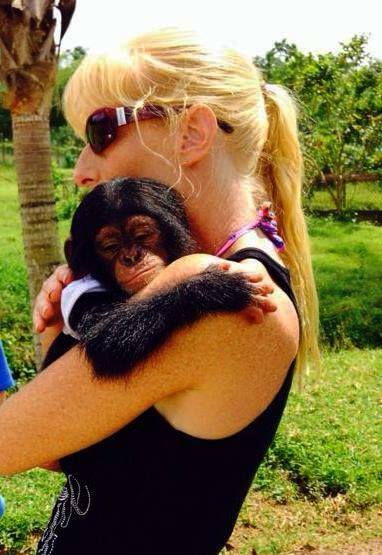 Gail's only objective, unselfishly in her love and many months of care for Missy eagerly and relentlessly searched for a safe and loving means for Missy to live out her life in an environment of her own kind. This is the first day Gail and Mark met Missy. In Gail's heart and mind, only a sanctuary where Missy could thrive, not as a spectacle of curiosity and revenue generation but, as a member of a safe and natural habitat providing the utmost in care and love among other chimps would suffice. The obstacles Gail faced in accomplishing this lofty goal were insurmountable. Living in Liberia, the poor, war-ravaged country with then-fiance, Mark (now her husband) who was there on a work project, was an adventure Gail never anticipated in her otherwise traditional life as a citizen of South Africa. 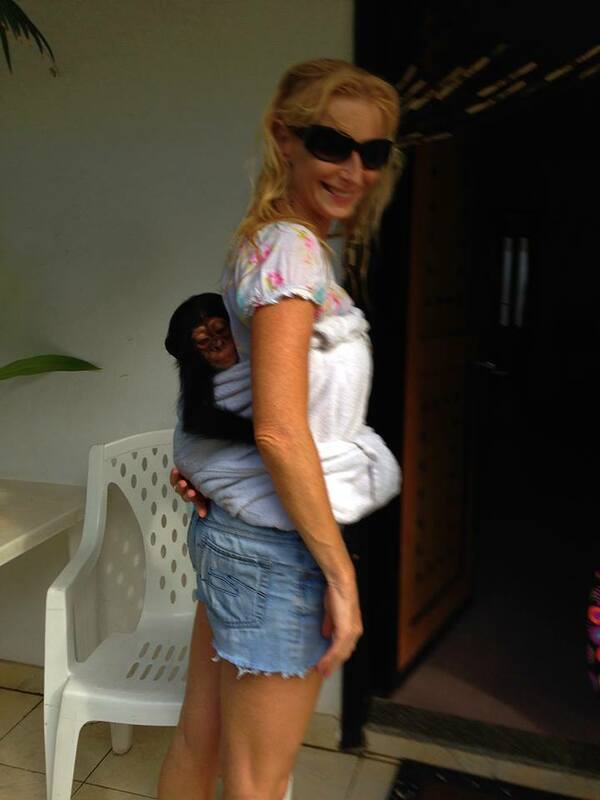 Missy in a makeshift backpack holding onto Gail. 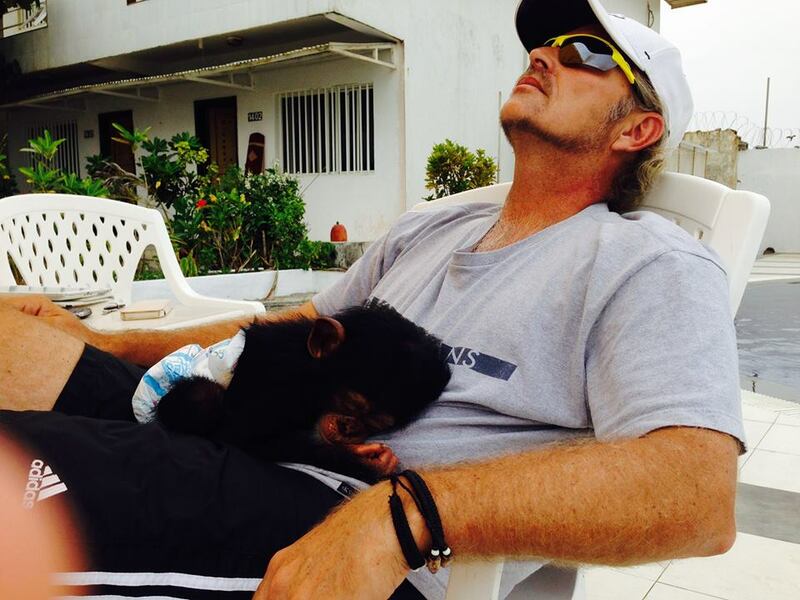 Mark never faltered in his dedication to support of Gail in saving Missy from a life of hunger, mistreatment and possible death. Together they created an impenetrable bond that beautifully remains today, now as residents of Marloth Park with their continuing compassion for wildlife. Liberia has a plethora of problems after years of rebel warfare and political unrest. In 2003, a ceasefire was declared but Liberia remains, even today, decades behind many African nations in its development and infrastructure which only added to the challenges Gail and Missy faced daily. 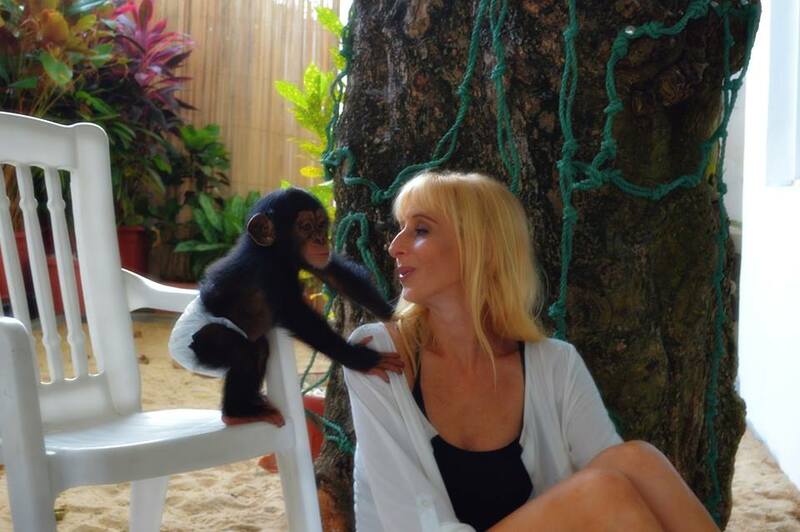 Missy learning to be a chimpanzee. 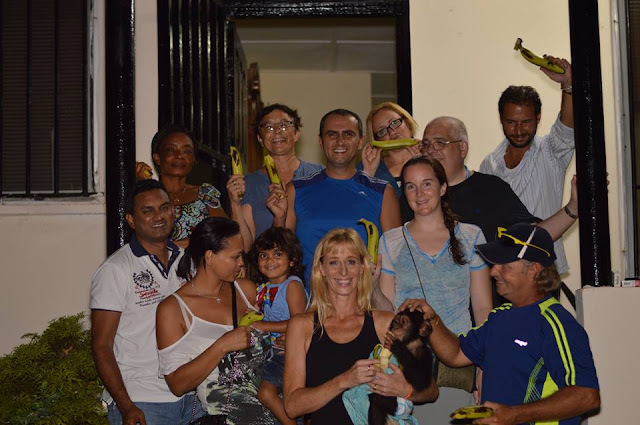 In 2014, during the time of the Ebola outbreak, a scenario of terrified and often unwarranted mistrust and fear of chimpanzees and apes was rampant. They were wrongfully considered as carriers of the deadly disease when in fact, it was the slaughter and unsafe handling of bushmeat, that ultimately spread the disease. Getting Missy out of Liberia became seemingly impossible when news of Ebola spread throughout the world and with it, the rumors of what and who was responsible for spreading the disease. Missy in the car with Gail and Mark. 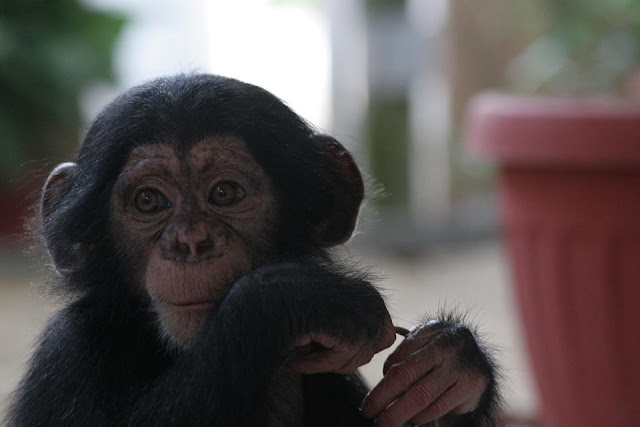 Through lack of factual data in the news (not uncommon, as we all so well know), the world too believed chimpanzees and other species in the ape family of animals, were carriers and original perpetrators of the spread of the disease. Missy was frail and recovering after Gail and Mark had returned to Liberia after a short necessary visit to South Africa. They had no choice but to leave her in the care of others until their return to find her in this heartbreaking state. In no time at all, she was thriving with Gail and Mark's loving attention and care. 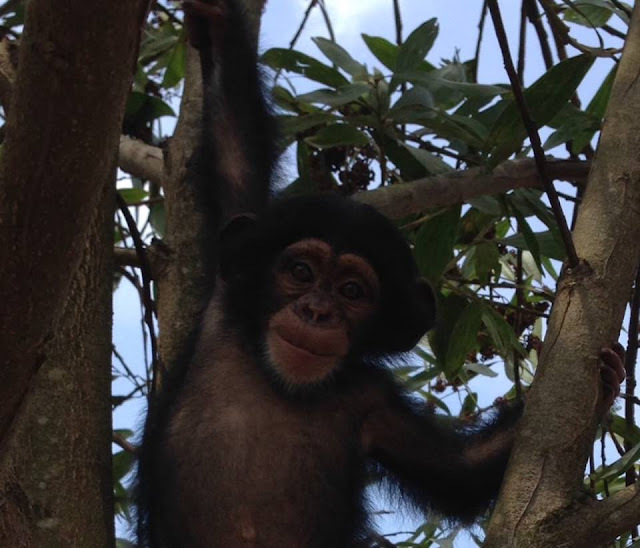 This resulted in insurmountable obstacles in getting Missy out of Liberia to the safe habitat awaiting her in: "Guinea, West Africa, within the Haut Niger National Park, the Chimpanzee Conservation Center (CCC) is a sanctuary established in 1997 to address increasing declines in chimpanzee populations due to the pet trade." There's so much more than we can possibly write about this special story of Missy. Rather than providing spoilers for the heartwarming, educational and inspiring story, Gail wrote in her book about this stunning struggle and profound outcome, "Her Name is Missy" is available for purchase here. 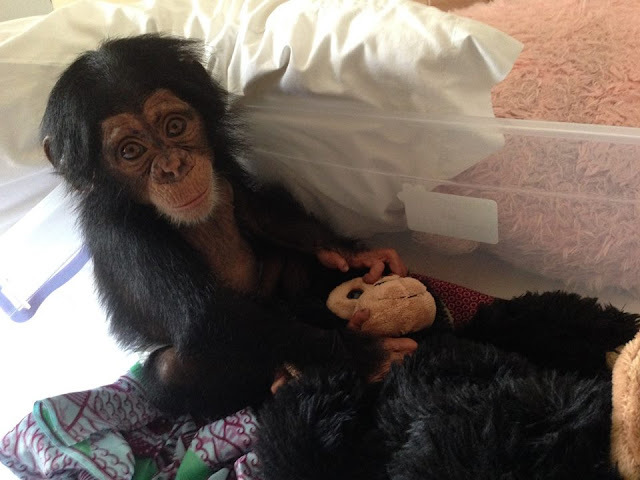 Missy with Mogli, her stuffed toy chimpanzee. As our readers are well aware, we don't promote products for purchase within the framework of our daily posts. Today is the exception. We encourage our readers to purchase this easy-to-read, can't-put-down book, beautifully described and written experience few of us can imagine. 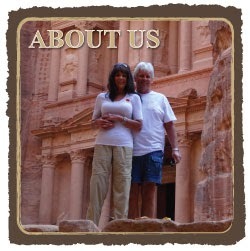 (We earn no portion of proceeds from the sale of the book). This adorable photo of Missy makes one wonder what chimps are thinking? When visiting Gail and Mark last Sunday at their lovely bush home and lodge, it was easy to see the joy in her eyes that will always be a part of the loving and compassionate person she is and will remain forever. Thank you, Gail, for sharing your story with us and our readers. It's ironic that in this life we live of world travel, we are gifted with endless opportunities to meet those whose inspiring lives contribute to our experiences that we'll carry with us forever. A last-minute farewell gathering for Missy. Finding a purpose, however infinitesimal or profound is the essence of who we become, who we are today and who we'll be in the future. May we all find such a purpose. Walk along the esplanade near the Sydney Opera House. For more photos, please click here.